Now that summer is upon us, we can finally abandon the scuffed and salt-stained boots and bring out the cool and colourful footwear. One of my personal faves of the shoes I've seen so far are these dove grey wingtips from John Fluevog. Not only do they have great perforated leather detailing, but they are also lined with electric blue leather (I was not going to ask her to take her shoe off to prove it, but she did anyway). 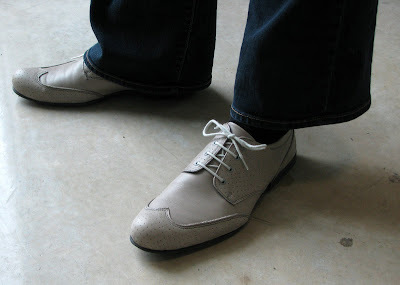 The pale grey colour makes them a perfect summer shoe when you want something more substantial to wear with jeans and a crisp tailored shirt.